Instructions for all three quilts included! Tokens of the Past is a continuing pattern series featuring several small, doll size quilts, wall hangings or table toppers. 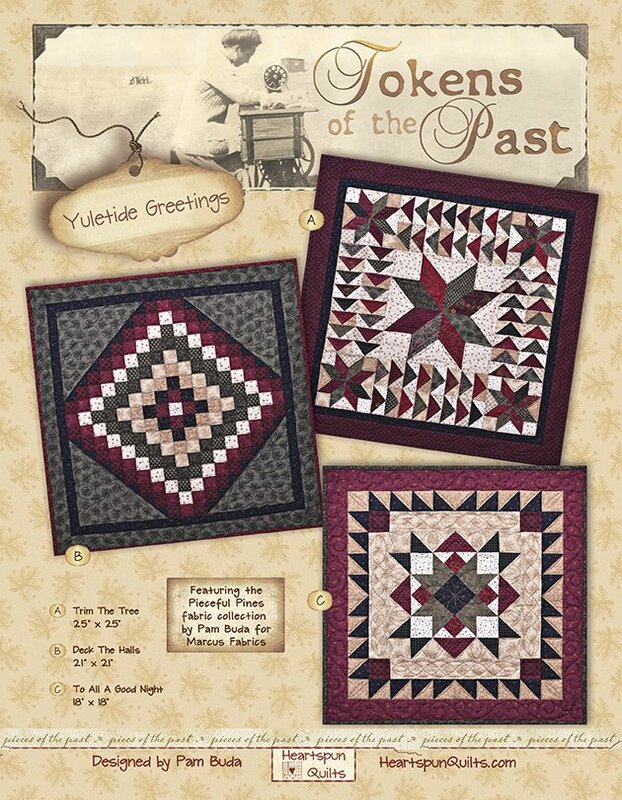 Yuletide Greetings is the eighth pattern in the series, and features three, new quilts all made from my Pieceful Pines fabric collection by Marcus Fabrics. I asked Marcus Fabrics to produce a 10 inch precut of 40 fabrics to go along with this pattern, and they did!! I made most of the units and blocks for all three quilts from just one Pieceful Pines 10 x 10 precut!! The pattern includes yardage and instructions to make all three quilts (from the pre-cut OR other fabrics), and/or you can certainly make each quilt separately as well. Quilt sizes are as follows: Trim The Tree 25" x 25", Deck The Halls 21" x 21", and To All A Good Night 18" x 18"
A limited number of kits for the Yuletide Greetings quilts are available now!! If you're interested, look for them here on my website under the PRODUCTS> Pam's Fabric> Kits category. If ordering outside of the U.S., please email me at Pam@HeartspunQuilts.com, and I will send you a PayPal invoice for the pattern and appropriate postage.